I have never liked pumpkin pie. Because of pumpkin pie, I believed until well into my adulthood that I hated all pumpkin things. But seriously, pumpkin pie is not the only way to enjoy your pumpkin this Thanksgiving. And why do pie when you can go cheesecake? 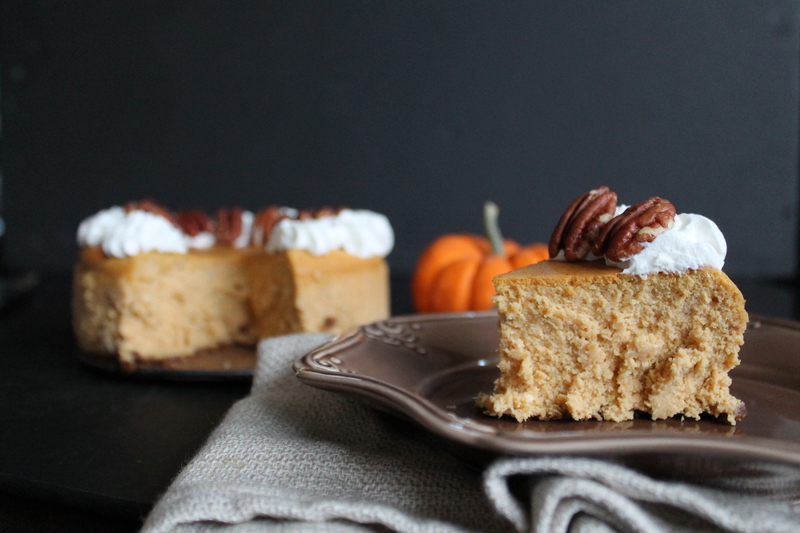 Pumpkin cheesecake is amazing and gorgeous, it’s creamy and tangy and sweet and warm with Fall spices. It’s basically Fall dessert perfection. I kind of have a cheesecake addiction. Which is why I do something a little weird when I make pumpkin cheesecake: I always make a tiny one. About a year ago, when I was making a cheesecake-filled wedding cake, I bought a little tiny springform pan…and now I like to protect myself a little bit by making very tiny cheesecakes. Smaller pieces = gaining less weight over the holidays, amiright? But since it’s Thanksgiving, I will tell you that it’s okay to make a large cheesecake. Just double the recipe below and bake it in a 9½″ springform pan. But also since it’s Thanksgiving, I will tell you that it’s okay to make a small cheesecake! Your family might thank you for your restraint. For example…in my family, we frequently have more desserts than people around the table. We really like dessert. So if I show up with a whole extra cheesecake, they might be glad it’s a small one. I’m just saying. We will make our crust first. 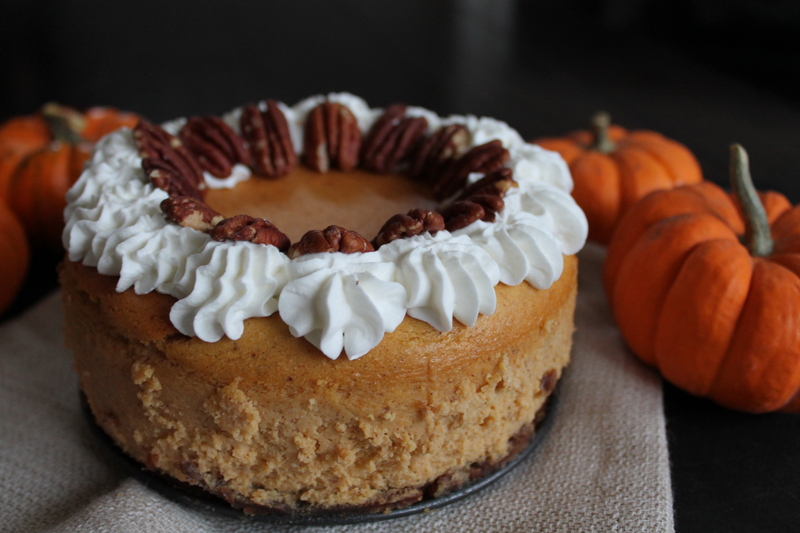 For pumpkin cheesecake, the warmth and spice of nuts and gingersnaps are just perfect! I also use some graham crackers for balance. After all, the crust should be fantastic, but we don’t want it to overwhelm the flavor of the cheesecake! 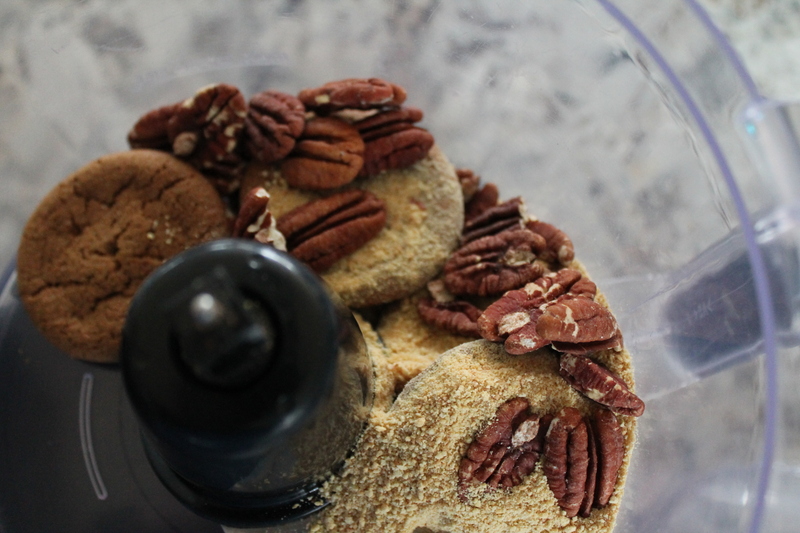 Just add the cookies, crackers, and nuts to a food processor and pulse or process until very fine and even. Then stir in melted butter. Either use salted butter (which is my preference) or add a hefty pinch of salt along with the unsalted butter. Now press those delicious crumbs into a 6″ springform pan, just on the bottom. Bake it for 8 minutes or so to set it. Always start with room temperature cream cheese. It’s okay for the other ingredients to be cold, but cold cream cheese will not soften well, even if you beat the heck out of it, and you will end up with a lumpy cheesecake. 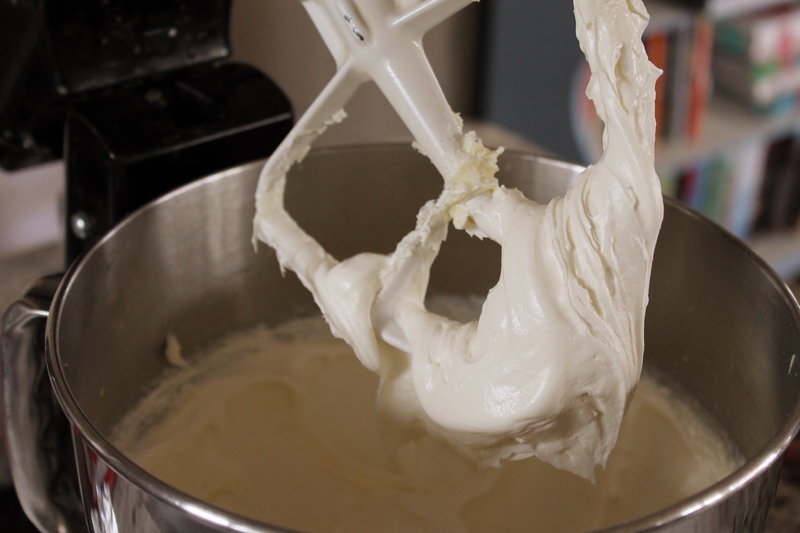 Beat the cream cheese until it is soft and creamy, then add sugar. Beat for 3 minutes, until light and fluffy. Make sure you scrape the sides of the bowl about halfway, otherwise you could still end up with stiff clumps in your cheesecake! Add in the pumpkin and stir well, until the whole mixture becomes soft and orange. 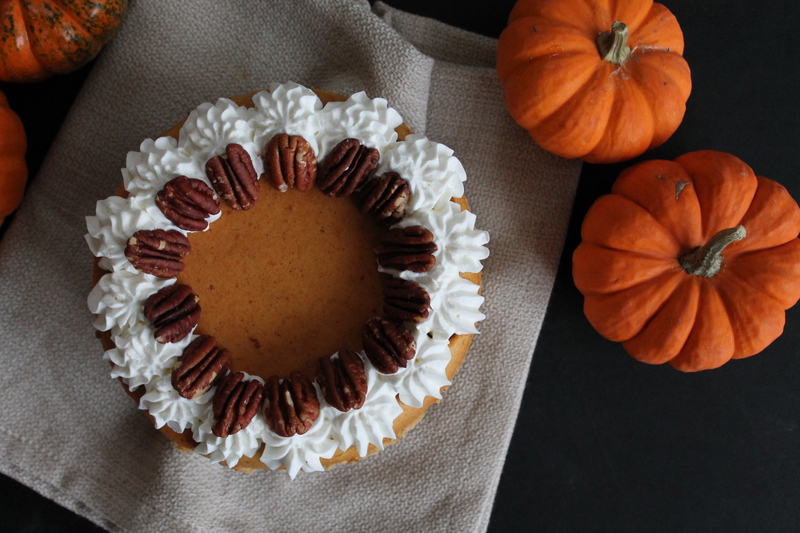 If your cream cheese is nice and soft, it should not take long to incorporate the pumpkin. Don’t forget to scrape the sides of the bowl! Beat in the eggs, one at a time, scraping the bowl in between. Add all those lovely warm spices. I think a dash of cardamom really complements pumpkin well, but if you don’t have any, you can skip it without too much harm. Finally, stir in a small amount of flour. The flour helps the cheesecake to set in spite of all the pumpkin we added. Even though it’s just a small amount of flour, I don’t really recommend trying to make this cheesecake gluten free by substituting a different type of flour here. Wheat flour has the unique property of being able to provide structure, helping the cheesecake to hold together, and absorption of some of the liquid, which is important considering how much pumpkin we used. Before you pour the beautiful cheesecake batter into the springform pan, we need to wrap the base of the pan with foil. Yes. We are going to do a water bath. What’s a water bath? It’s when you plunk an unbaked, custardy dessert into a larger dish full of boiling water to create a hot humidity while it bakes. In the case of cheesecake, it helps the cheesecake to bake properly because it causes the raw cheesecake to heat up more slowly (water boils at 212°F, which means the sides of the pan cannot exceed that temperature until the water evaporates). When the cheesecake heats up more slowly, it is less likely to crack on top. It also takes longer to bake. Just FYI. So wrap the base and sides of the springform in foil, because we do not want any water to leak into the delicious pecan crust! This is another advantage of making a smaller cheesecake: a single sheet of foil will definitely be large enough to cover the bottom and sides of the pan! This is good because you won’t need to worry so much about sealing multiple pieces of foil together to prevent leaks. Scrape most of the cheesecake batter into the springform pan with the crust. You will have about 1 cup of leftover cheesecake batter, even after filling the springform pan nearly to the top (leave ½″ gap to the top of the pan). There are lots of things you can do with the extra, such as make individual cheesecakes in a muffin tin, or even stuff it inside of a cupcake or muffin recipe for a variation on black bottom-style cupcakes! The reason I persist in making the smaller size cheesecake, even when there is too much batter for the pan, is simply that I don’t want to have a massive cheesecake hanging around my house (momma likes to eat!) and that tweaking the ingredient list so that the whole thing fits just right inside the small pan would result in a lot of awkward measurements. I don’t mind a little leftover batter to repurpose elsewhere, but if you do, then go ahead and double the whole thing to bake inside a 9½″ springform pan. Okay. Almost ready to bake! We just need to get our water bath going. 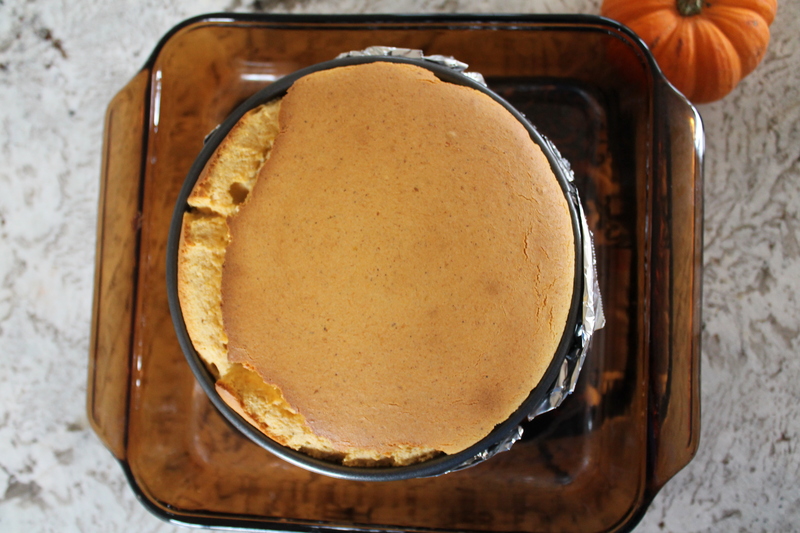 Set the foil-wrapped cheesecake pan into a larger dish. I used an 8″ square glass baking dish, which fit perfectly. Pour boiling water into the dish, being careful not to splash the cheesecake, until it is about half as deep as the cheesecake is tall. Let the cheesecake cool completely on a wire rack. Chill for 4 hours before serving. We eat first with our eyes, people, and I am a firm believer in setting up proper expectations, such as This cheesecake has nuts in it! So I like to decorate the top of the cheesecake with some extra toasted pecans. Cute and informative, amiright? Combine the gingersnaps, graham crumbs or crackers, and toasted pecans for the crust in a food processor and process until fine and crumbly. Stir in melted butter. Press the crust mixture into the bottom of a 6″ springform pan. Bake for 8 minutes, until lightly browned and set. Set aside to cool. Meanwhile, beat the cream cheese until soft and smooth. Add in the sugar and beat on high speed for 3 minutes to aerate. Scrape the sides of the bowl about halfway to ensure there are no firmer clumps of cream cheese stuck to the sides of the bowl. Add the pumpkin and beat until incorporated. Beat in the eggs and yolk, one at a time, scraping the sides of the bowl between each addition. Stir in the spices, salt, and vanilla. Stir in the flour. Scrape the sides of the bowl well to ensure everything is incorporated. 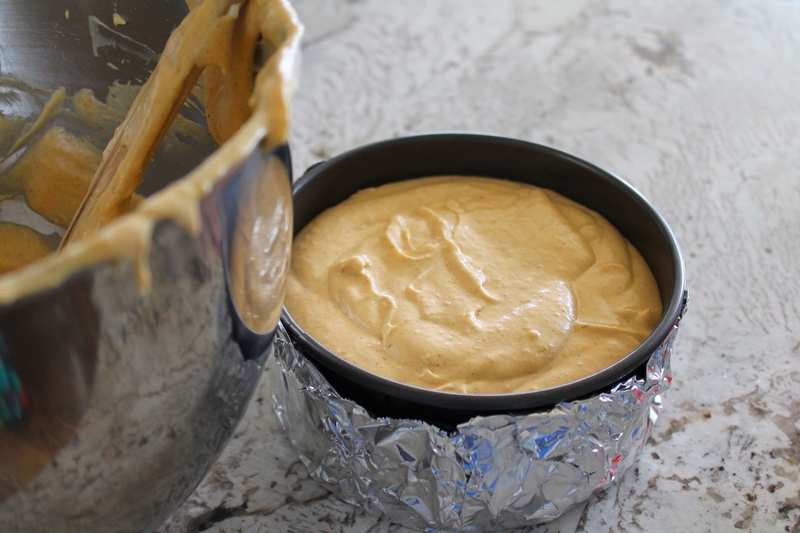 Wrap the base and sides of the springform pan in securely foil. Bring 2 cups water to a boil. Pour or scrape the cheesecake batter into the springform pan over the crust, leaving a ½″ gap between the top of the batter and the top of the pan. 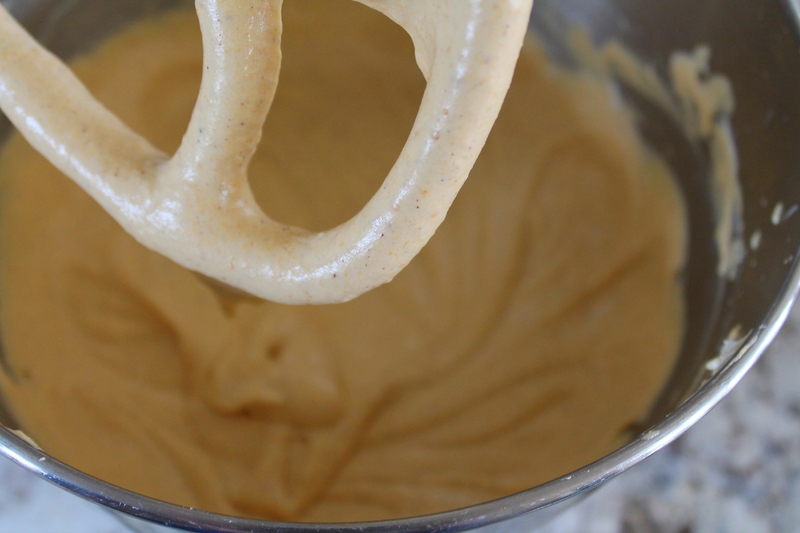 Reserve the extra cheesecake batter for another use. Drop the cheesecake from a height of 2″ onto the counter 3 or 4 times, to release any large air bubbles. Place the cheesecake pan into an 8″ square baking dish. Pour the boiling water into the bottom of the pan, being careful not to splash any water into the cheesecake. Bake at 350° for 75–90 minutes, until the cheesecake is puffed, lightly browned on top, and set in the center. Cool completely on a wire rack, then chill in the refrigerator for 4 hours before serving. Garnish with toasted pecans and whipped cream as desired.